ATLANTA The head of Delta Air Lines (DAL) on Friday joined the growing opposition to the Transportation Security Administration's new policy allowing passengers to carry small knives onto planes. Delta CEO Richard Anderson said in a letter to TSA Administrator John Pistole that he shares the "legitimate concerns" of the airline's flight attendants about the new policy. Allowing small knives to be carried on board after a ban of more than 11 years "will add little value to the customer security process flow in relation to the additional risk for our cabin staff and customers," Anderson said in the letter, which was obtained by The Associated Press. "If the purpose is to increase security checkpoint flow, there are much more effective steps we can take together to streamline the security checkpoints with risk-based screening mechanisms," he said. Delta, based in Atlanta, is the world's second-largest airline. It is the first major airline to join not only flight attendants but pilots, federal air marshals and insurance companies in a burgeoning backlash to the policy. Pistole announced the policy on Tuesday. TSA spokesman David Castelveter declined to comment on the letter. He said TSA plans to implement the policy on April 25 as scheduled. Airlines for America, a trade association representing major U.S. airlines, has been supportive of TSA without explicitly endorsing the policy. "We support the TSA's approach of combining its vast experience with billions of passenger screenings with thorough risk-based assessments," Jean Medina, a spokeswoman for the association, said in response to a request Friday for the association's position. Anderson cited only small knives in his letter. The policy will also allow passengers to include in their carry-on luggage novelty-size baseball bats less than 24 inches long, toy plastic bats, billiard cues, ski poles, hockey sticks, lacrosse sticks and two golf clubs. Items like box cutters and razor blades are still prohibited. Knives permitted under the policy must be able to fold up and have blades that are 2.36 inches or less in length and are less than 1/2-inch wide. 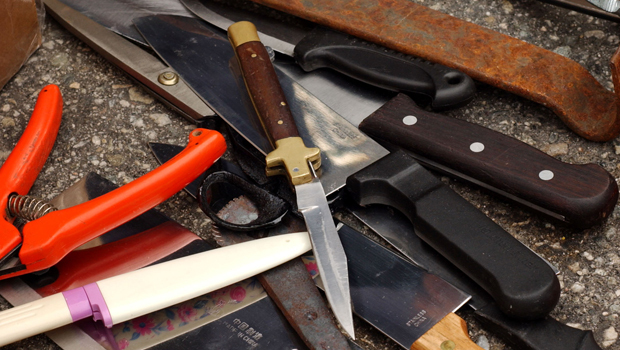 The policy is aimed at allowing passengers to carry pen knives, corkscrews with small blades and other small knives. There has been a gradual easing of some of the security measures applied to airline passengers after the Sept. 11, 2001, terrorist attacks. The new policy conforms U.S. security standards to international standards and allows the TSA to concentrate its energies on more serious safety threats, the agency said when it announced the change this week. The policy change was based on a recommendation from an internal TSA working group, which decided the items represented no real danger, the agency has said. TSA has said the presence on flights of gun-carrying pilots traveling as passengers, federal air marshals and airline crew members trained in self-defense provide additional layers of security to protect against misuse of the newly allowed items. Not all flights, however, have federal air marshals or armed pilots onboard. The Flight Attendants Union Coalition, representing nearly 90,000 flight attendants, said Thursday it is coordinating a nationwide legislative and public education campaign to reverse the policy. A petition posted by the flight attendants on the White House's "We the People" website had nearly 12,000 signatures late Friday urging the administration to tell the TSA to keep knives off planes. "The continued ban on dangerous objects is an integral layer in aviation security and must remain in place," the coalition, which is made up of five unions, said in a statement. Jon Adler, national president of the Federal Law Enforcement Officers Association, whose 26,000 members include federal air marshals, complained that he and other "stakeholders" weren't consulted by TSA before the "countersafety policy" was announced. He said the association will ask Congress to block the policy change. The Coalition of Airline Pilot Associations, which represents 22,000 pilots, said it opposes allowing knives of any kind in airliner cabins. "We believe the (terrorism) threat is still real and the removal of any layer of security will put crewmembers and the flying public unnecessarily in harm's way," Mike Karn, the coalition's president, said. The new policy has touched off a debate over the mission of TSA and whether the agency is supposed to concentrate exclusively on preventing terrorists from hijacking or blowing up planes, or whether it should also help protect air travelers and flight crews from unruly and sometimes dangerous passengers. "The charter, the mission of TSA is to stop an airplane from being used as a weapon and to stop catastrophic damage to that aircraft," David Castelveter, a spokesman for the agency, said. Pistole's position is "these small knives, these baseball bats, these sporting items aren't going to contribute to bringing an airplane down," he said. In an era of reinforced cockpit doors and passengers who have shown a willingness to intervene, the threat from terrorism has been greatly reduced, said Andrew R. Thomas, a University of Akron business professor and author of several books on the airline industry and security. "Acts of aberrant, abusive and abnormal passenger behavior known as air rage remain the most persistent threat to aviation security," he said. Adler, representing the air marshals, said aviation security is neither "terrorist-proof nor psycho-proof," and both should be protected against. TSA's "primary concern, and their only concern, is to protect the cockpit to make sure the planes aren't turned into missiles," he complained. "Traveling Americans are expendable, disposable and otherwise irrelevant to air travel safety." The new policy has aviation insurers concerned as well. "We think this move is a bad idea, and isn't in the interests of the traveling public or flight crews in the aviation industry," said Joe Strickland, head of American operations for Allianz Global Corporate & Specialty, a leading global aviation insurer. "Safety is the highest priority of every commercial air carrier, flight crew member and air traffic controller," he said. "We don't see how these changes support this priority."